Not everyone is able to go the extra mile to send to military addresses – we understand that, and they shouldn’t be blamed for it – but those who do are special people indeed. They are booklovers who really care. They sympathize with how tough it would be to be so far from a source of books. So they make the extra effort to fill out the (short) customs form and take the package to the PO, and they don’t panic if it is declared “lost” en route – they know it might take time to get to its eager reader. The requestor does her part here too, by marking the books received as promptly as possible – from the Transaction Archive if they are already “lost” before they arrive. Our members are wonderful in so many ways – this is one of them! We are made proud every day by the spirit of sharing and caring that exists at PBS. (1) Check the edition! The club is a great source for some kinds of schoolbooks – classics, Shakespeare plays, and the like — and for texts that do not get updated very frequently. Keep in mind that although ISBN, author, title and book type must all match the listing, publication date does not have to match – and if more than one edition of a book shares the same ISBN, it can be possible to get either edition when you put in your request. That means that for textbooks that are frequently updated, you’ll need to make a little extra effort to be sure you get the edition that you need. If the edition is specified in the title on the listing, then the book should match the listing, but a Personal Message to the sender when requesting the book is not a bad idea, to be sure he or she didn’t make a mistake in posting. (Sometimes a member, despite the instructions on the Post Books screen, will enter the ISBN and click Post, and doesn’t make sure the rest of the listing matches.) Since some textbooks will keep the same ISBN through many updates, this can be a pitfall for the school-shopper. Keep in mind, however, that some updates don’t change the book much, and depending on the subject, sometimes more than one edition will be usable for a class. (2) Order early. Remember that Media Mail can be variable in its transit time. Even though the average book arrives within about a week after it is mailed, sometimes books take longer. So be sure to put in your request in plenty of time to get the book for your class. It can be a little extra effort to make sure you get a version of the book that you can use, Coco, but it’s worth it! The price of new textbooks can really be shocking. If even one textbook can be gotten here instead of buying it new, the savings could be substantial. Don’t forget to start your Amazon shopping from the link at the top of the PBS site – when you do this, a small percentage of your purchase amount comes to us. Please note that if you are an e-book reader, it used to be that e-book purchases at Amazon did not count to support the PBS site, but now they do! So be sure that whenever you plan to purchase on Amazon, that you start from the Amazon link at the top of the PBS site. It’s an easy, free way to support the club! Share and Share alike. <—Those icons are now at the top of every page, under the blue banner. They allow you to tweet a link, send a link in an email, display a book listing on facebook or myspace…or a ton of other options. Wanna tell everyone on facebook what you’re currently reading? Click the icon when you’re on the Book Details page for that book, choose Facebook, type in a comment if you want, and boom! it goes onto your facebook page. Tell people what books you’ve mailed out, what books you’re wishing for…whatever you want to share. Try it…you’ll like it. Don’t forget that if you have never used PBS-DC before, you have 3 free trials of the feature! The 19-cent USPS e-DC fee still applies (you pay that with extra postage applied to the package) but the 27-cent PBS fee is waived for three separate shipments if you want to try this out. PBS Delivery Confirmation comes with Quick Credit (and with Guaranteed Credit for accounts with good sending records). To try this out, choose “Print with Delivery Confirmation alone” (the middle option on the Wrapper Settings page) and your wrapper will print out with a DC barcode. The offer is good until October 24th. You can read more about PBS-DC here, in the Help Center. Printable Postage is not included in this offer –it’s just for PBS-DC. PBS Store News: PBS Cookbook final proof has been approved and printing is in process – Members have been flipping over the BookFlips (get ’em while we still have ’em!) 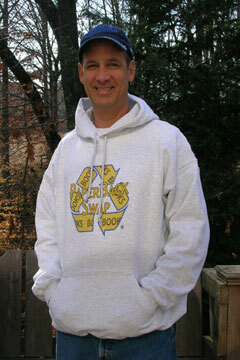 – and now that cooler weather is on the way, it may be time for a cozy PBS sweatshirt. Richard wearing his awesome PBS Sweatshirt. APO/FPO/DPO members: For those of you at military/diplomatic addresses, you know that you have had to use the mandatory Requestor Conditions (RCs) on your accounts. But what about the requests to APO/FPO/DPO addresses that are submitted by stateside members? We have changed things so that if a request is submitted to be sent to an APO/FPO or DPO address, the Requestor Conditions will be applied automatically. If you have other text in your Requestor Conditions, that will be included – it will appear above the mandatory PBS text on the request. You can read the text for the mandatory PBS APO/FPO/DPO RCs at the bottom of the Help doc here. Be a card-carrying member… of all three sites! The Omni Business Card is hot off the presses: it can be customized with your name (you can choose NOT to show your name! ), nickname, join date – as you like. It’s a great way to refer new people to all three clubs and get referral credit! You can download and print these for free from the Spread the Word page. Check out the PBS business cards, bookmarks and flyers also available for download from that page, under Community at the top of any page on the site. The email was actually encouraging you to rate or even review the book, if you had read it. Assigning star ratings is one of the most helpful things a member can do for the club — it helps other members get a better idea if they might want to order that book. It also helps any member who has posted the book – a highly-rated book is more likely to be requested. So rate those you have, and those you don’t have but have read! And if you’re feeling chatty, reviewing a book is really a terrific thing to do also, to let other members know what you thought of a book. It doesn’t have to be a “literary” review – but hearing from another member why she or he liked (or didn’t like) a book can really mean a lot to someone who is browsing for his or her next read. “Real words” from “real members” carry a lot more power than the publisher’s blurb!